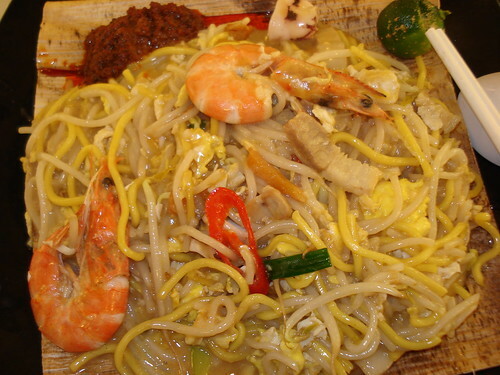 Hokkien Mee, originally uploaded by Camemberu. I slurped this all up. Lovely gooey gravy full of seafood goodness. Sweet umami satisfaction. Still, not as good as the first time I tried it though - it was a different chef this time, a lady. Watching your food prepared before your eyes can be a great appetiser. Love seeing the crispy pork lard pieces thrown into the oil. I also saw the chef ladle on what seemed to be thick, rich broth onto the noodle concoction while before letting it simmer. And I didn't have to wait long for this dish to be ready and served up on opeh leaf (merits of this leaf imparting extra flavour to the food are still up for debate, but hey, I like the way it looks, if nothing else). Of course, not all was perfect. The prawns were bland and their shells stuck fast to the skin, making them hard to peel. The chili sauce also did not complement the dish somehow. However, the small pieces of squid were cooked just right, soft and not chewy. S$4 from "Cockles Kway Teow" stall at the Parkway Parade "Treats" basement food court. Oh their other dishes are not too bad either. Char kway teow a tad on the sweet side, as is their seafood mee goreng, but both pack in lots of flavour. I can't remember if I've tried their carrot cake.